Typically, today’s local schools and higher-education campuses range in size from single level, multi-wing facilities, covering 20+ acres, to numerous multi-level buildings that encompass several city blocks; all possessing a legion of access points. And school districts can easily span an area of one-thousand square miles, and more. Multiple access points and large areas of operation, combined with less than optimal communications, can place a strain on campuses’ and districts’ safety and severely impede a rapid response to disruptions and emergencies. Two-way radios and other forms of wireless communication (WiFi, cellular, etc.) are commonplace devices that can be integrated into school operations for administrators, security personnel, key team members and maintenance staff to communicate on matters of security, safety, supervision and facility upkeep. Not only are radios and other wireless devices helpful with day-to-day tasks and security issues, they are critical in effectively managing a crisis; acute situations in which seconds can make a huge difference. Mobile Communications partners with you, in a consultative fashion, to ensure those seconds have the potential to make a vast difference. 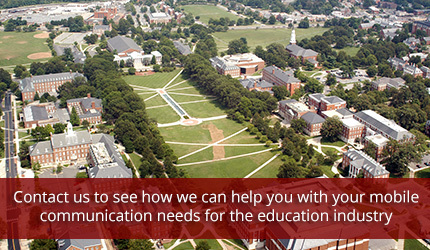 A crystal clear, cost effective communications solution is available on your campus, today.